The Grace College Lancers will hope to leave their mark at the 2018 NCCAA National Championships later this month. 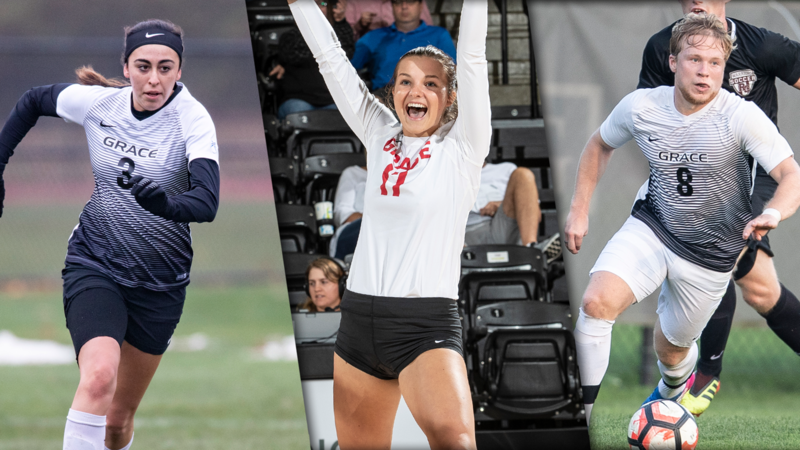 Grace volleyball, men’s soccer and women’s soccer each earned a berth to the national tournament, held from Nov. 26 to Dec. 1. The soccer tournament is held at the Austin-Tindall Soccer Complex in Kissimmee, Fla. The men’s soccer team earned the No. 2 seed in the nine-team field. Grace will play Columbia International on Nov. 26 and Ottawa Arizona on Nov. 28 in its two pool play matches. The winner of each pool along with the top runner-up will secure a bid to the semifinals to be played on Nov. 30. The women’s soccer team qualified as the No. 3 seed as an at-large invitee in the eight-team field. The Lady Lancers are in a pool with No. 2 Oklahoma Wesleyan, No. 6 Warner and No. 7 Central Christian. The winner of Grace’s pool will play for the national championship on Dec. 1.